Once more than one Widget has been added they can be easily reordered within a Page. Click the Widget that needs moving and then clicking the arrow up, down or the ‘switch’ double arrow icon which appears in between horizontally side-by-side Widgets. To have Widgets appear horizontally side-by-side, click an existing Widget and then click the blue circle Plus icon to its right. You can have up to three widgets on a horizontal row if the Page Layout is set to Full Width Page. If the Page Layout is set to Page with Sidebar, you can only have two widgets side-by-side horizontally on the Page. If you select the far left widget, when you have two widgets, and then click the Plus on the far right, it will add the third widget to the centre. 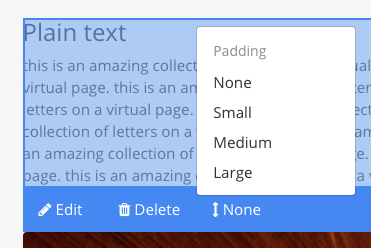 Add padding/spacing below a widget by selecting a widget and then clicking "None" and selecting the amount of free space you want below that Widget.